This spacious 3 bedroom beach frontage duplex has magnificent ocean views and deck access from main bedroom, 2nd bedroom and living/dining room. Ensuite to main bedroom, 3rd bedroom, spa room, laundry, double lock up garage, large deck with fantastic Northerly Aspect of Views to Tura Headland. Tura Beach's 18 hole Championship Golf Course is 100 metres from your doorstep. 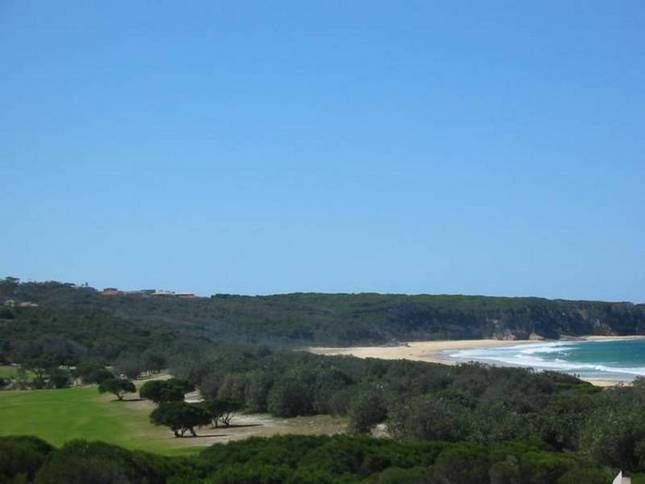 Sur la Plage is a five minute drive from the heart of Merimbula and a 15 minute drive to Pambula which also supports another great golf course. TV, Video, Microwave, Dishwasher, Gas Heating. 100 metres to golf course, fishermans paradise, beach fishing 1 minute walk from your back door. 5 metres from the deck and you will have your feet in the golden sands of Tura Beach ready for your stroll. Wildlife, Whale Watching, Shops and Clubs, Magic Mountain fun park, Top fun amusement Park all within 5 minutes drive. National Parks and State Forests.Take a scenic drive to nearby Tathra Beach historic Wharf and visit the numerous art gallerys along the way to Bega where you can sample some of the countries finest cheese at the Bega Cheese Factory, also visit the local Wineries. Only a hour away from the magistic Tilba Tilba for a trip back in time. Lots to see and do or just relax and soak up the sun. Check out the image gallery for some more great pics or this prime accommodation that couldn't fit on the main page. this has everything going for it，location and clean all things you need. We thoroughly enjoyed our Stay at Sur La Plage. The location was very clean, beautiful and peaceful. We loved being so close to such a quiet beach and having our morning beach walk and coffee on the deck while listening to the waves. Our whole experience was most enjoyable and we will be back again soon. Great location! We were two adults and a toddler. The apartment was more than big enough for our small family. The decor is a bit dated but the apartment was spotless. Steps from beautiful Tura beach. Nice beach side property. easy access to the beach. Great for Fishing and lazing around. Swimming was tough due to high tides and rough waves. Tura beach is a beautiful location, we will definitely visit again. The decor is a little outdated but overall the place is perfect for getaway with comfortable beds and amazing sea views- what more could you want? Had a great week there. 2 couples, heaps of room and a wonderful view of the Tura Beach surf.